Leaves: Several, usually basal, alternate, flat to inversely W-shaped, 2-10(-36) inches long, .1 to .4 inch wide, shorter than to equaling culm, margins scabrous, bases forming cylindric sheaths enclosing stem, lower sheaths often purplish proximally. 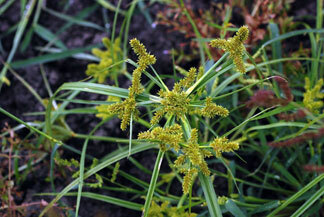 Inflorescences: Compound umbel with 1-6 sessile spikes, rays 2-6(-12), divergent, .4-3.2(-10) inches long; (3-)5-7(-11) leaf-like bracts subtend the inflorescence, horizontal to ascending, inversely W-shaped, 4-8(-28) inches long, .04-.12(-.5) inch wide, generally surpassing inflorescence; spikes densely cylindric-ovoid, .2 to 1.8 inches long, .24 to 1 inch wide. Spikelets: Spikelets (20-)40-80, crowded, linear, 4-sided, .12 to .4 inch long, .04 to .06 inch wide, scales 6-16(-60), reddish-brown, medially greenish, appressed, oblong-ovate, apex obtuse; stamens 3; stigmas 3-cleft. Fruits: Achenes, gray or whitish, sessile, ovoid, .04 inch, three-sided, glabrous; seed 1. Habitat: Shores of ponds and lakes, mud flats, sandbars; occasionally in shallow water; often in sandy soils. Uses: Good food source for waterfowl. Comments: The roots are usually reddish. Cyperus from ancient Greek "Cypeiros" and erythrorhizos, "erythros", red, and "rhiz", roots. Red-rooted flatsedge may grow only a few inches tall in areas that are often flooded.